Purnomo, Natalia (2005) Dampak kekerasan psikologis suami terhadap harga diri istri. Skripsi thesis, universitas Tarumanagara. Although a family is usually considered to be a loving and supportive social institution, it is, in fact, more violent than military, except in times of war (Olson DeFrain, 2000). 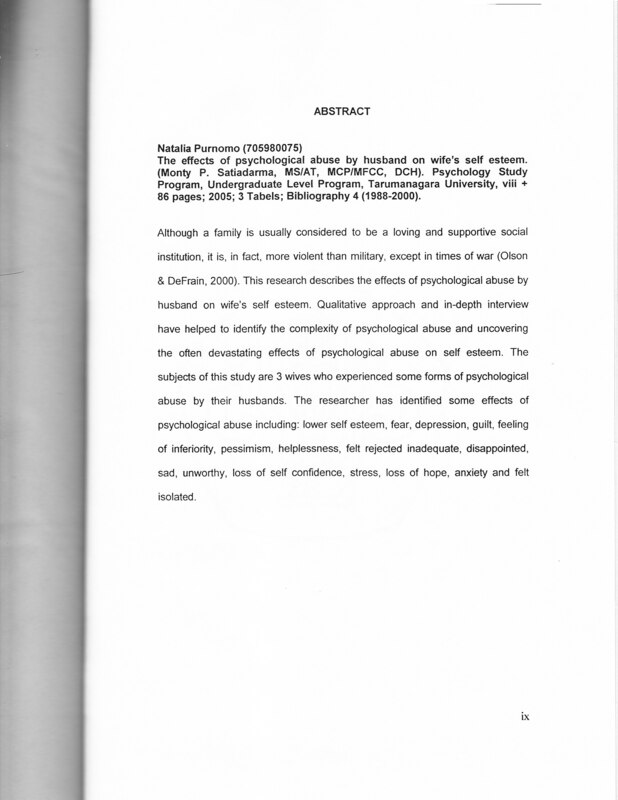 This research describes the effects of psychological abuse by husband on wife's self esteem. Qualitative approach and in-depth interview have helped to identify the complexity of psychological abuse and unoovering the often devastating effects of psychological abuse on self esteem. The subjects of this study are 3 wives who experienced some forms of psychological abuse by their husbands. The researcher has identified some effects of 5 psychological abuse including: lower self esteem, fear, depression, guilt, feeling of inferiority, pessimism, helplessness, felt rejected inadequate, disappointed, sad, unworthy, loss of self confidence, stress, loss of hope, anxiety and felt isolated.